Feel the adrenaline rush as you stand face to face with your opponent !! 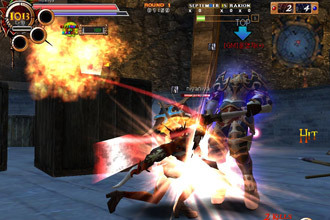 The object of 'Rakion: Chaos Force' is to offer you the sensation of thrill and intensity of going into a battle to face your enemy. After standing face to face with your enemy you will first-handedly experience the intensity, and all of a sudden, you will find yourself engaging into a battle with your enemy with strong bash attacks and combinations. Rakion also provides guard and catch techniques. Using various combinations, you can utilize strong catch attacks that will spin your enemy into the air giving you the opportunity to smash the enemy with your hammer. Also many different catch skills are provided in the game for you to use.